Rudyard Kipling called the Mehrangarh Fort in Jodhpur, ‘a palace that might have been built by titans and coloured by the morning sun’. This poetic description aptly captures the character of the colossal stone fortress perched on the top of a rocky hill, towering over the faded blue city below. I visited the fort for the first time in the Summer of 2016. 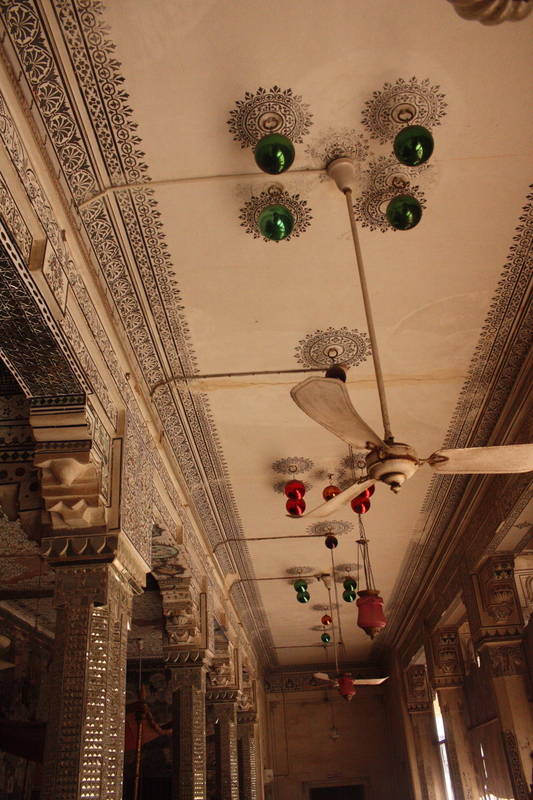 Usually even glittering palaces lose their appeal in temperatures approaching 50 degrees celsius, but not Mehrangarh. 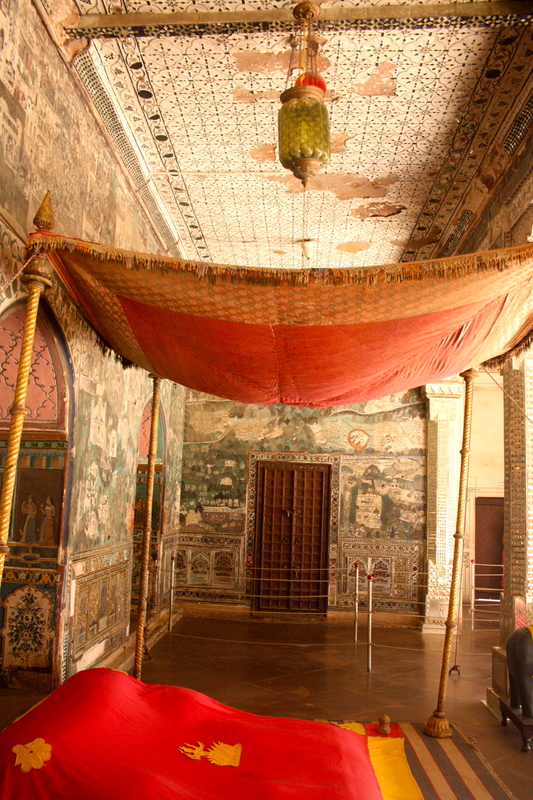 Within the fort, the architecture ranges from the solid, sturdy and seemingly invincible, to the fragile, exquisite and richly ornate. The highlight of my visit though, was not the magnificent architecture, the mirrored ceilings or the gilded furniture, but rather a room full of paintings, many of which were displayed at the British Museum exhibition, ‘Gardens and Cosmos: The Royal Paintings of Jodhpur’ in 2009. I was breath-taken when I first laid eyes on the paintings and even more astounded when viewing them in the setting for which they were intended. The paintings were commissioned by three consecutive maharajas and range in date from the first half of the 18th century to the mid-19th century. Their scale, most measuring over a metre in length, make them unusual in the oeuvre of Indian miniature painting. 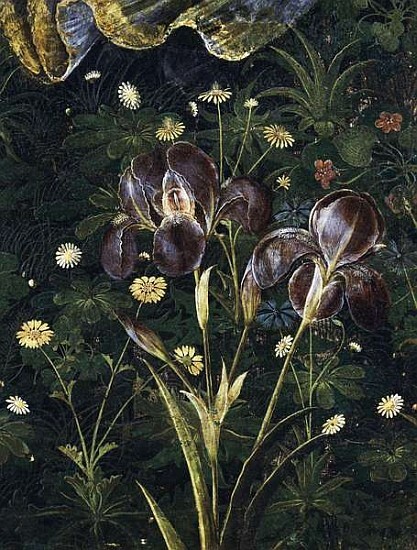 The painting itself though, remains deliciously detailed and intricate, every brush stroke made with expert precision. Many of the paintings created for the perusal of Maharaja Bakhat Singh (1725-1751) depict typical princely scenes portraying the king frolicking in his pleasure palace surrounded by graceful ladies adorning manicured gardens. The painting below shows the Maharaja immersed in a playful water fight with his wives and courtesans in a palace pond. During this period depictions of scenes from sacred texts and epics such as the Ramayana were also created. These are vivid, bold and fantastical compositions. One could wax lyrical about them for days on end. A fascinating aspect of some of these paintings is that they show a sequence of events happening within a single image, in contrast to most compositions which capture a moment in time. The image below imaginatively portrays a sequence of episodes from the Ramcharitmanas of Tulsidas (based on Valmiki’s Ramayana). The focal point is the crossing to Lanka, with Rama and Lakshmana leading an army of monkeys and bears across the sea in preparation for battle. Rama and his half-brother Lakshmana are depicted four times. Firstly, they are shown standing on top of a cliff on the left hand side of the painting puzzling over how they will cross the ocean; secondly, performing a sacrifice; thirdly, crossing the causeway built for them by monkeys and bears; and lastly, in wicked Ravana’s kingdom of Lanka. The ten-headed, multi-armed demon Ravana can be seen looking down at the approaching army from the uppermost terrace of his golden palace. Most of the subordinate demons are shown with horns. The two images below form halves of one exquisite painting commissioned by Maharaja Vijay Singh between c.1780 and 1790. 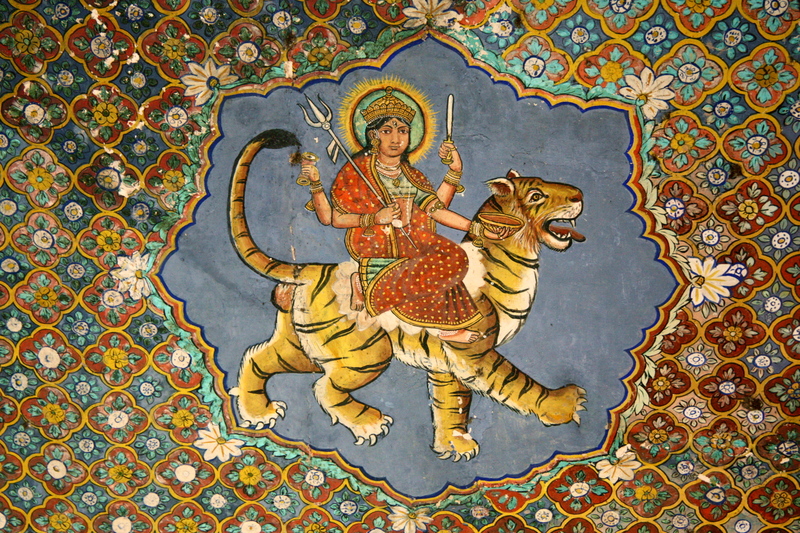 It is an illustration of an episode in the Durga Charita. On the left we have a hermitage peopled by long-haired ascetics with ash-smeared skin seated within little huts made for one. The leaf covered habitations blend seamlessly into the verdant, hilly landscape. The main focal point of this half of the composition is Sage Markandeya seated on an antelope skin outside his dwelling place. Kneeling before him are a king and a merchant. The two visitors tell the sage of their miseries. The first has lost his kingdom, the other, his wealth. Markandeya soothes their woes by revealing that the world is but an illusion. The reality is depicted in the other half of the image: Lord Vishnu asleep on his thousand-headed serpent Sesha in the vast cosmic ocean. In his slumber the god dreams up the world. The paintings below were created for the last of our three maharajas, Man Singh (r. 1803-1843), who could not have been further removed from Bakhat Singh in his approach to kingship and to life in general. Man Singh was deeply spiritual and fell under the spell of the guru Dev Nath and the legendary yogi, Jalandarnath. The Naths became so powerful under the maharaja that they were governing the land by proxy, enforcing law and carrying out retributions. 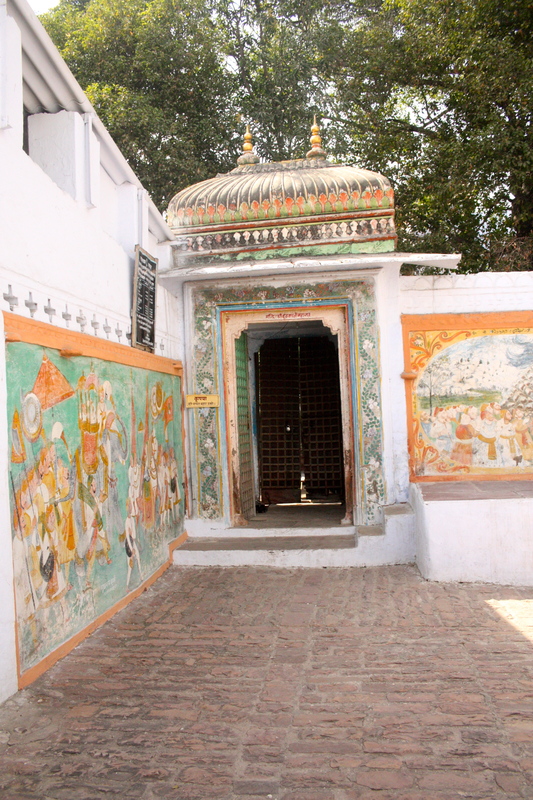 Man Singh went as far as to call his kingdom an offering to the Naths. His devotion to these increasingly troublesome yogis was to be his undoing. Eventually he was overthrown with the help of the British. Below is an ash covered Nath Siddha (a perfected being) in meditation. Positioned along the spinal cord of the Nath are energy centres or chakras inhabited by Hindu deities and Nath Siddhas. The Nath Siddhas are placed above the deities because the Naths believed that perfected beings or yogis were more powerful and more invincible than the gods. 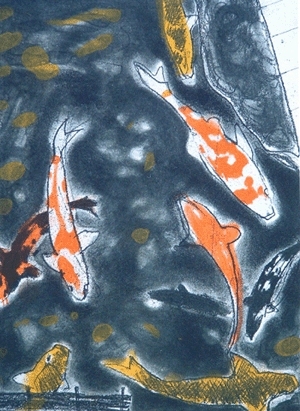 The triptych below represents spirit and matter. In a startling move away from tradition, the first panel representing the origins of the cosmos and of the formless absolute is painted plain gold. 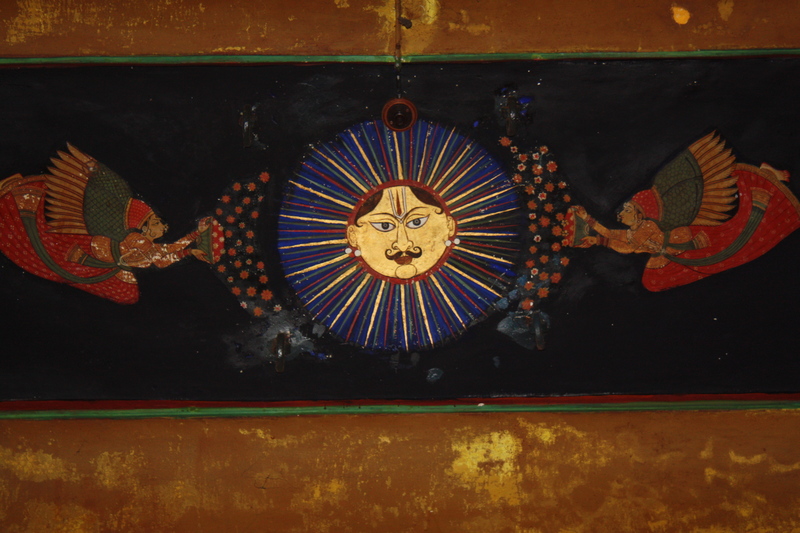 The two deities in the second and third panels represent consciousness and matter. Shaikh Zain ud-din, ‘Sulphur Crested Cockatoo on a Custard Apple Branch’, 61.5 x 86 cm, 1777. In 1773 Sir Elijah Impey moved from England to India to assume his role as first Chief Justice of the Supreme Court at Fort William, Calcutta, under the direction of the ill-fated Governor-General, Warren Hastings. Elijah’s wife, the natural historian, Mary Impey, moved with him and soon established a menagerie of Indian and South East Asian birds and animals in their extensive grounds. In 1777 Mary commissioned artists (among them Shaikh Zain ud-din, Ram Das and Bhawani Das) to paint her exotic flora and fauna. These skillful and accurate paintings numbered 362 and became part of a collection known as the Impey Album. Most of the images are inscribed both in Persian and in English by Mary herself. Lady Mary also kept copious notes on the inhabitants of her menagerie which were to prove valuable to later botanists. Shaikh Zain ud-din, ‘Pair of Lorikeets on Broken Branches’, 50.8 x 73.66 cm, 1780, Los Angeles County Museum of Art. The paintings belong to the Company School of art, in other words, encyclopaedic images commissioned by members of the East India Company to appeal to British tastes. They reflect the then British penchant for studiously and systematically recording everything down to the minutae of daily life in India. The Impey Album is a particularly fine example of this genre of painting, especially the works produced by the artist, Shaikh Zain ud-din, which really need to be seen ‘in the flesh’ in order to fully appreciate their skilful execution and striking beauty. A Map of Fort William, Calcutta, 1844. Johan Zoffany, Lord and Lady Impey in India with some of their children and staff. A Green-winged Macaw’, attributed to Shaikh Zain ud-din, c. 1780, San Diego Museum of Art. Shaikh Zain ud-din, ‘A Golden-fronted Leafbird Perched on a Peach Tree Branch’. Shaikh Zain ud-din, ‘Pied Hornbill’, 1777. Shaikh Zain ud-din, ‘Common Crane’, 88.2 x 60.6 cm, 1780. Shaikh Zain ud-din, ‘Black-necked Stork’, 83.8 x 60.1 cm, 1781. Shaikh Zain-ud din, ‘Black-necked Stork II’, 95.5 x 62.5 cm, 1782. Shaikh Zain ud-din, ‘Adjutant Stork’, 96.4 x 58.5 cm, c. 1780. Shaikh Zain ud-din, ‘Sarus Crane’, 95 x 61.2 cm, c. 1780. Shaikh Zain ud-din, ‘Greater Flamingo’, 89.4 x 62.6 cm, 1781.
of an Indian Cherry Tree’, 1777, sold by Forgelynch in 2014. Shaikh Zain ud-din, ‘Exotic Pheasant’, c. 1777. 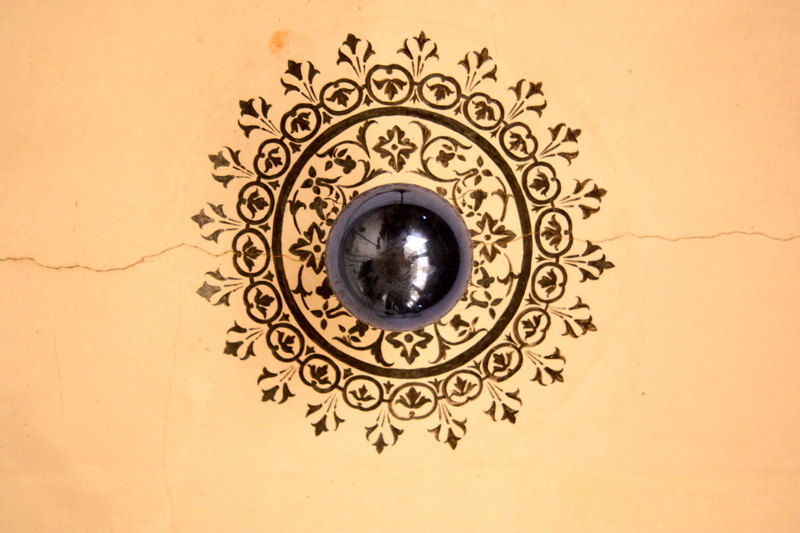 Detail of a painting by Shaikh Zain ud-din depicting a Curucui, 1779. Sold at Christie’s. Bhawani Das, ‘A Branch of a Mango Tree’, c. 1780,65.5 x 45.4 cm, Victoria and Albert Museum, London. Black Stork in Landscape’, 90.2 x 68.6 cm, c. 1780, Metropolitan Museum of Art, New York. It is not known who painted this image of a Black Stork but based on style, scale and date of execution it could be by Shaikh Zain ud-din or at the very least, a pupil or admirer. Unlike most Shaikh Zain ud-din paintings, the composition includes a landscape. I have a suspicion, though, that the landscape with its tiny meandering river is a later addition by someone seeking to ‘improve’ the painting since it doesn’t accord with the scale or accurate rendering of the bird. One of Mumbai’s jewels is its principle museum, the Chhatrapati Shivaji Maharaj Vastu Sangrahalaya (previously known as the Prince of Wales Museum). 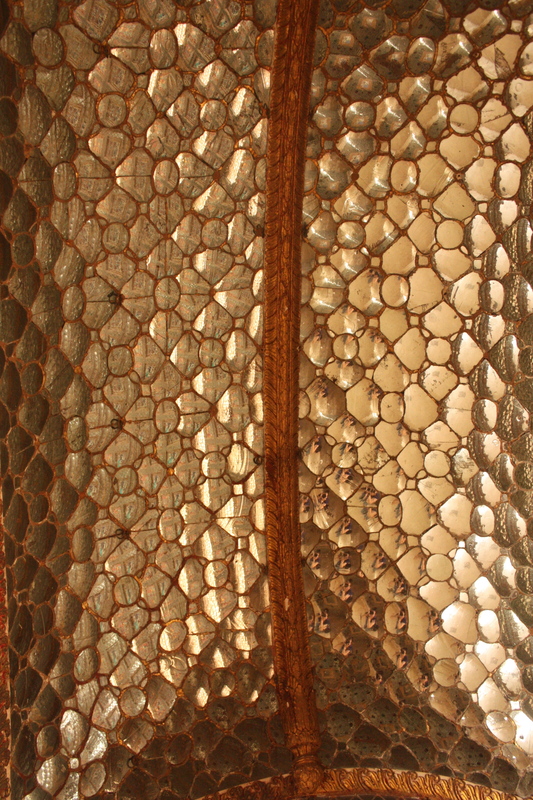 The museum is a veritable treasure trove of pan-Indian sculptures, paintings, objet d’art and fabrics. Among its most exceptional exhibits are the glorious terracottas from the exterior of a stupa at Kahu-jo-daro, Mirpurkhas, in the Sindh province of Pakistan, dating to the late fifth or early sixth century CE. Mirpurkhas is located on the ancient trade route known as the Aprāntapatha which leads along the west coast from the Bolan Pass in the north to Trivandrum in the south. Unlike most museums which tend to relegate terracotta art to some dark corner, or label them ‘minor arts’, the CSMVS has placed some of the Kahu-jo-daro exhibits in pride of place its spacious entrance atrium. The brick stupa was excavated by Henry Cousens between 1909-1910. Originally the monument had two terraces, a dome and an entrance to the west. Now only the square basement terrace survives in a ruined state. Around this basement terrace ran a series of pilasters and between each pair of pilasters was a niche enshrining a seated Buddha, eleven in total, although only seven survive (one is in the V&A Museum). Though the Buddhas of Kahu-jo-daro have their own uniqueness, they bear a strong stylistic likeness – especially in the treatment of the facial features – to Buddha images from Mes Anyak and across ancient Gandhara. 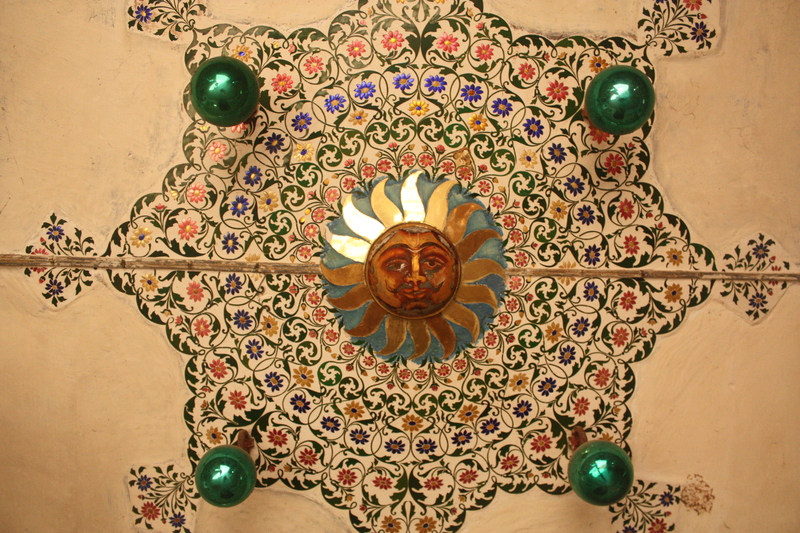 The relief sculptures were originally painted with coloured slips and traces of this can still be seen in places. 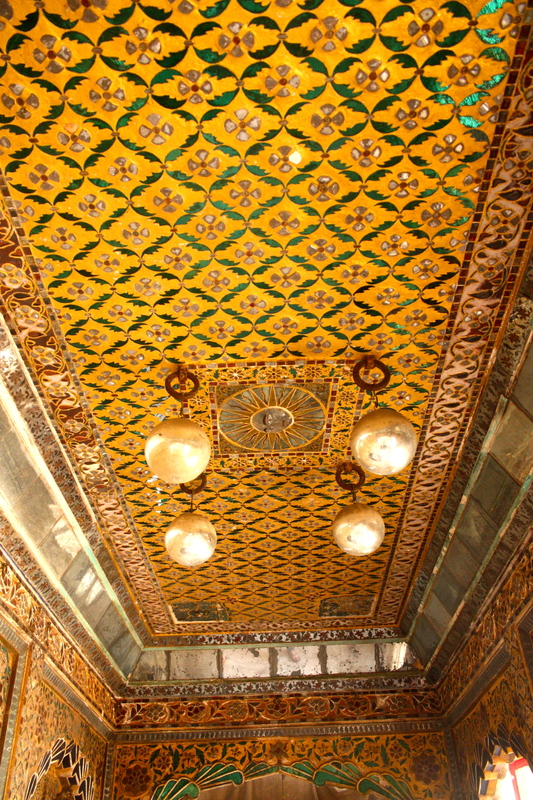 The monument was also decorated with terracotta bricks carved with geometric designs, leaves and flowers, and lion heads. The exquisite Buddhas are seated on lotuses and in the lotus position. The lotus is one of the eight auspicious symbols of Buddhism and represents purity. The Buddhas hold their hands in a gesture which symbolises meditation. Their eyes are downcast and they look at nothing in particular as though thoughtless and detached from their surroundings. Even though the composition is the same, each Buddha is slightly different and this variety adds charm. Earlier this month the Minister for Culture, Antiquities and Tourism in Sindh, Syed Sardar Ali Shah, announced his intention to preserve the ancient site of Kahu-jo-daro (at least what is left of it) and build a museum in Mirpurkhas. He also suggested that UNESCO will help them to repatriate the Mirpurkhas antiquities from India and the United Kingdom. This terracotta roundel might depict Kubera, god of wealth. This same type of beautiful elephant is found on most monuments of the fifth century CE. This narrative image depicts Queen Maya giving birth to the Buddha in Lumbini, out of her left side. She is often shown clutching a tree above her head as she gives birth. This small fragment depicts a kirtimukha or lion head spewing pearls. It is an image found on most early temples. When at the British Museum just before Christmas I bought a fascinating book, a Jungian tome on symbols and archetypal images. The text is interesting, though not perhaps as expansive – or as well-referenced – as it could be. More inspiring is the eclectic choice of illustrations sourced from around the world and spanning a period of over 2000 years. It is rare to see such a diverse collection of images, with most art history books focusing on the West, or on a specific subject matter such as 18th century Japanese art, or Burmese bronzes. The illustrations in this book are an affirmation of the genius and creativity of man and also of the power of the collective unconscious. Hokusai (1760-1849), Amida Waterfall on the Kiso Highway, Japan. I find this print captivatingly grandiose and delicate at the same time. The depiction of a waterfall is highly stylised, majestic, and ethereal, its scale emphasised by the inclusion of three small men picnicking on a precipice. Uccello, St. George and the Dragon, 1465, Italy. 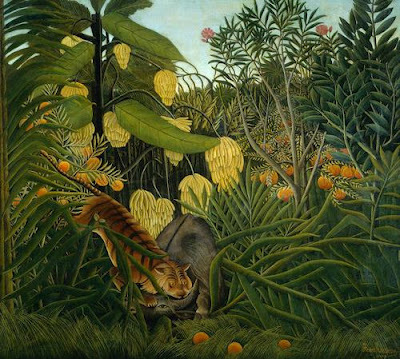 This bold composition with its vivid colouring is one of my favourite paintings at the National Gallery, London. St.George, clad in armour and riding a white horse, is in the midst of saving the princess by spearing the dragon. 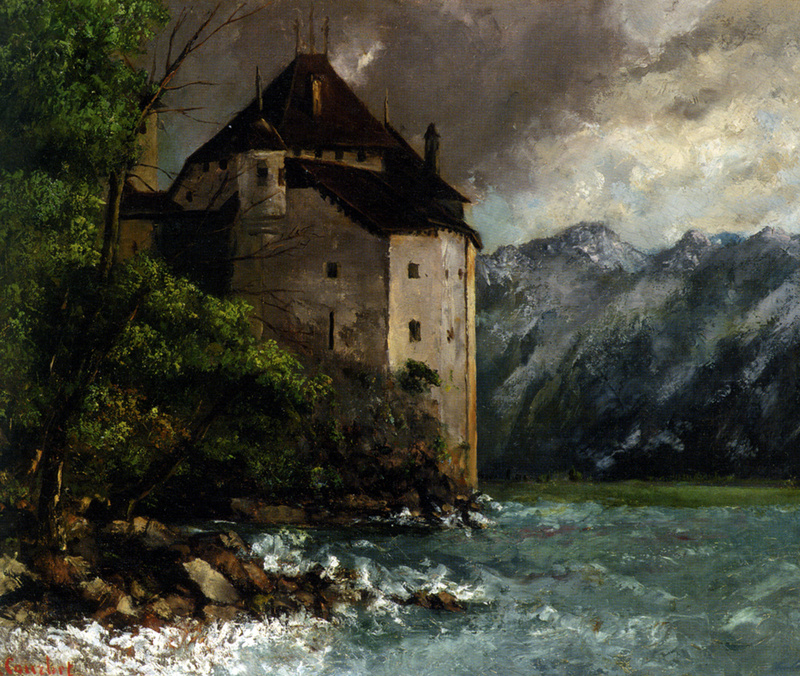 Behind him is a dark forest and spiralling clouds, contributing to the drama of the scene. The princess, however, stands, unperturbed, holding the dragon on a leash as though it were a pet dog. “Inside the Bubble of Love,” a detail from The Garden of Earthly Delights by Bosch, c. 1504, the Netherlands. Hieronymous Bosch – the first surrealist? 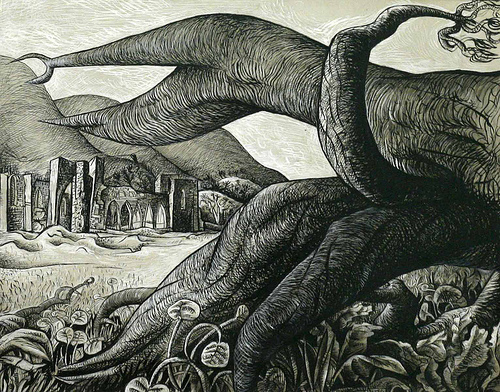 An altogether bizarre scene which is on the one hand, distinctly medieval, and on the other hand oddly 21st century with its peculiar juxtaposition of objects and nature, and almost nightmarish in its conception, with giant birds, oversized foliage and small people. It brings to mind Roald Dahl’s ‘James and the Giant Peach’ which terrified me as a child. Kotah Master, Rana Jagat Singh II of Kotah, Rajasthan, c. 1750 – 1800, India. I was drawn to this painting because I visited the palace at Kota earlier this year (see a previous post). Today the palace is a little decrepit, with a few splendid reminders of how rich and extravagant this complex once was. This miniature depicts the gardens of the Rajput palace when they were still very much alive and in use. Looking at this painting is strangely nostalgic, albeit nostalgic for something never experienced. Ogata Korin (1658-1716), Raijin, detail from Gods of Wind and Thunder. Japan. Raijin is the Japanese god of thunder, here looking rather comical. William Blake (1805), The Descent of Man into the Vale of Death: “But Hope Rekindled, Only to Illume the Shades of Death, and Light Her to the Tomb,” England. A magnetic example of Blake’s visionary world. 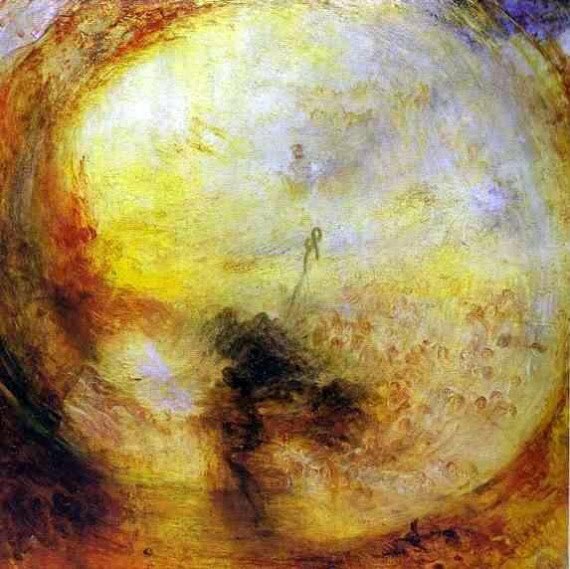 Here ‘death is depicted as an “under” world, to which the spirits of the dead initially descend before Hope illuminates the possibility of an eternal home.’ (432) The underworld is a labyrinth of catacombs into which a steady stream of figures are descending from the hills above. 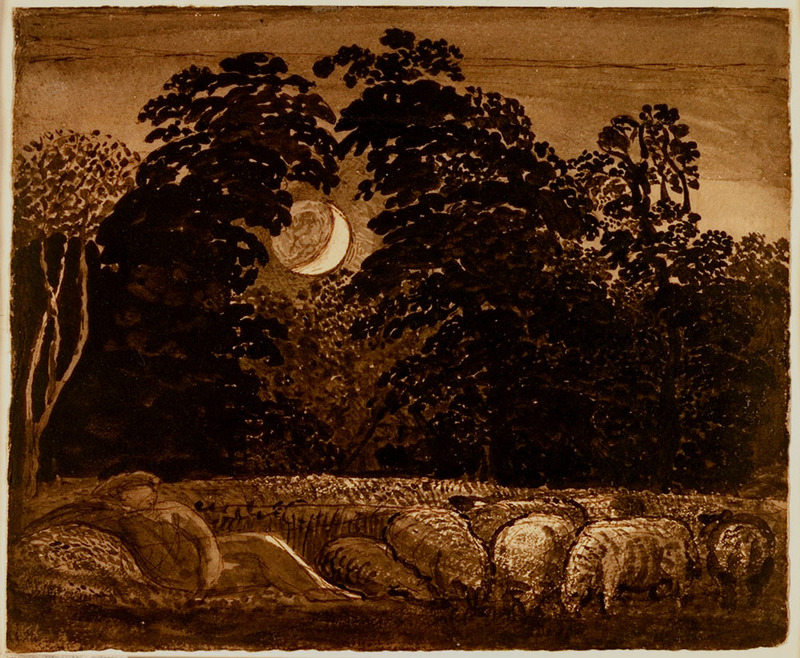 Samuel Palmer, “The Sleeping Shephard” 1832. 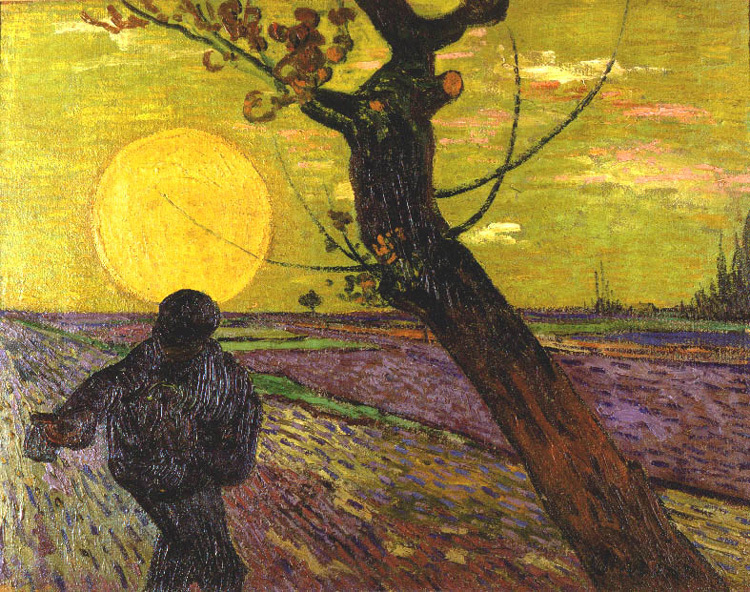 I never tire of this painting with its honeyed hues, mysterious light, and those dark, confident lines. Despite the intensity of the composition, this is a soft and intimate scene depicting a solitary man, sowing seeds, creating life. The painting is overwhelmingly tranquil, especially to urban eyes. Perhaps though the reality is starkly different, perhaps the farm worker is exhausted, living a gruelling existence. 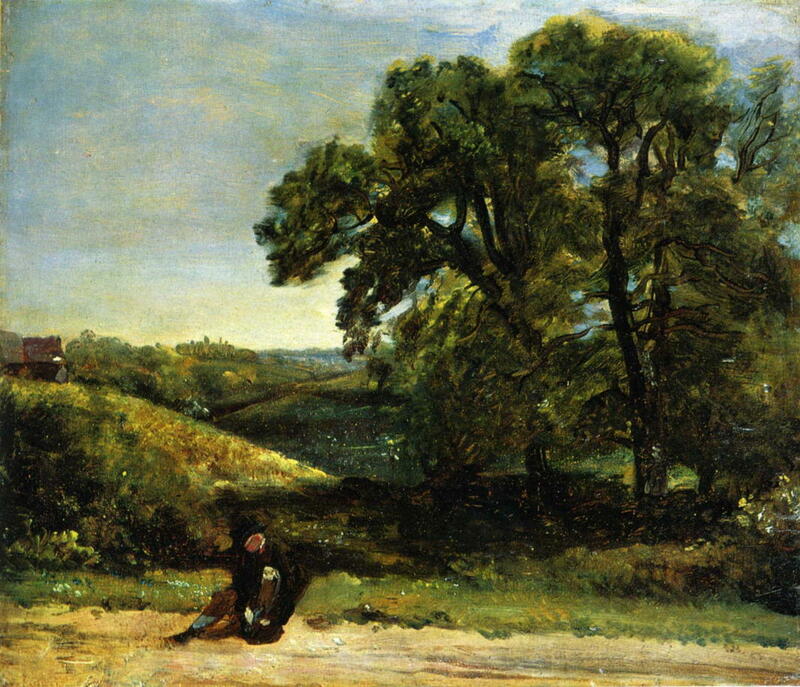 The man in this painting is anonymous, his identity is not important. He is simply another soul acting out his part in life. 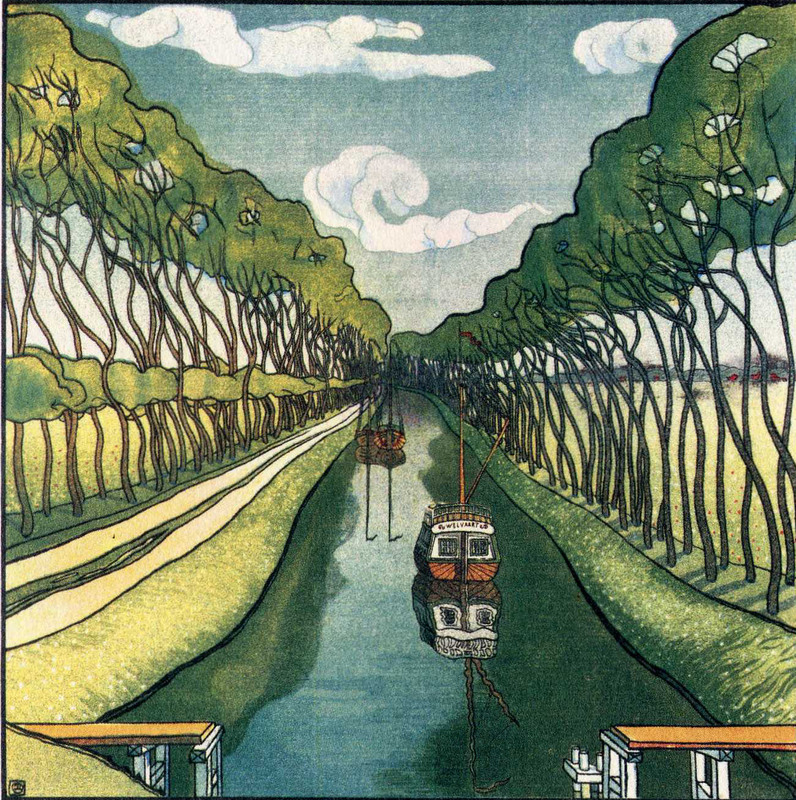 There is a reason why Van Gogh’s paintings are so coveted today. He had the ability to capture or convey something so extraordinarily primal, so dark, and yet so comforting in his landscapes, something that is inside each and every one of us. Something that we all long to return too. 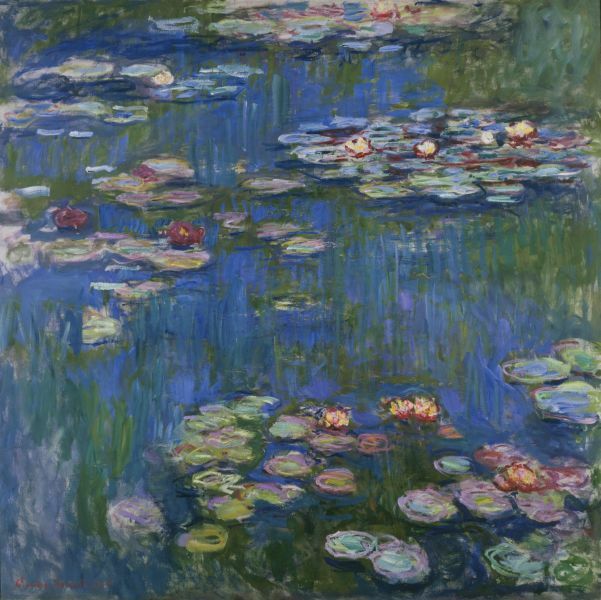 Claude Monet, “Water Lilies” 1916. 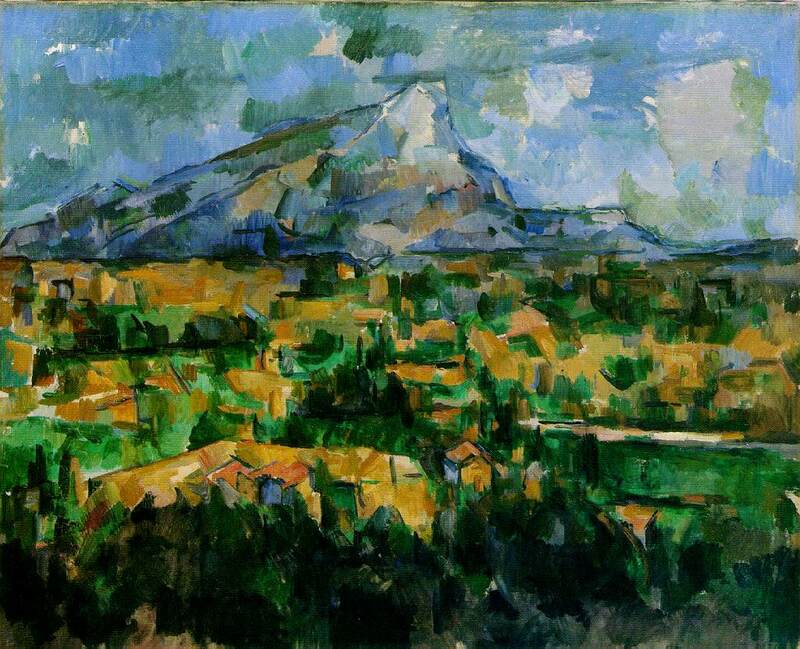 Cezanne, “Le Mont Saint-Victoire” 1902-4. Philadelphia Museum of Art. 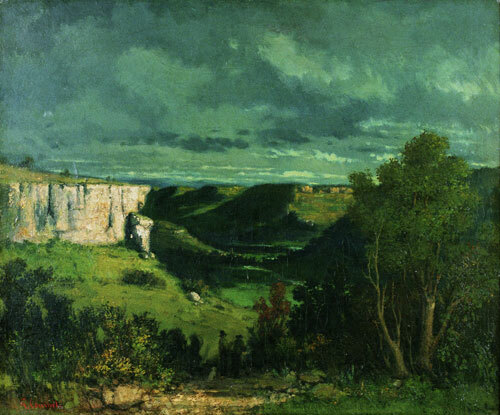 Gustav Courbet, “The Valley of the Loue in Stormy Weather” 1849. 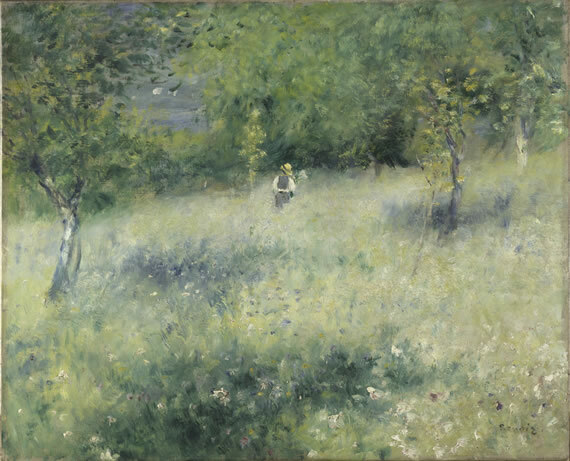 Auguste Renoir, “Springtime in Chatou” 1875. Just your average day bed!